Carry The Load holds a 2,000-mile relay from West Point, New York to Dallas, Texas each may, and several Memorial Day events and rallies in cities around the country. Monies raised support charities dedicated to helping the families of military and first responders lost in the line of duty. Caliber partners with Carry The Load and will have volunteers and walkers participating along the relay route near local centers. As we have expanded into additional regions in the past year, we will have teammates from our Maryland, Virginia, North Carolina and South Carolina locations representing Caliber as the relay route travels through each area. We will also have strong representation at the Carry The Load Dallas and Austin events. 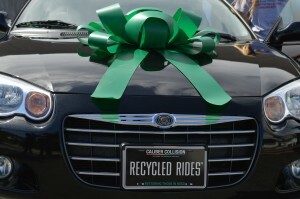 Caliber will also be gifting three refurbished vehicles at this year’s Dallas event and one vehicle at the Austin event as part of the Recycled Rides® program. These will go to deserving military veterans in the each local community. Restoring the meaning of Memorial Day is a movement Caliber really believes in, and the opportunity to restore the rhythm of veterans’ lives through the Recycled Rides program makes Carry The Load’s Memorial Day events even more meaningful to all of our Caliber team members. To view the national relay route, register to form your own Carry The Load team, or make a donation to help a hero’s family, click here. Every day, struggling families all over our country worry about how they’ll get to work, get their groceries and get to their doctor’s appointments without reliable transportation. Recycled Rides is designed to put an end to these hardships by donating newly refurbished vehicles to deserving families. This April, Caliber will gift a newly refurbished vehicle to a deservingU.S. avy Veteran at the Caliber Burbank – S. Lake location in Burbank, CA. As part of the Caliber Recycled Rides® program, Caliber partners with one of our valued insurance partners, and Caliber team members volunteer their time to refurbish a damaged vehicle and, more importantly, restore the rhythm of a national hero’s life. For the Burbank event, we are proud to be partnering with Esurance, who was instrumental in making this gift possible. Caliber began the Recycled Rides program in 2011 in an effort to ensure deserving members of the community had reliable transportation. In only the program’s third year, 20 vehicles were donated. The program continues to gain momentum, and the 2015 goal is to gift 25 vehicles. Five of these are scheduled to be gifted at the Carry The Load – Dallas event, and one additional vehicle will be donated at the CTL – Austin event. If you know a deserving veteran, in the Dallas or Austin areas, who could benefit from the Recycled Rides program, you can make a nomination by clicking here.